The TORT TALK EXPO 2012 CLE Seminar is set to take place on May 3, 2012 at the Mohegan Sun Casino in Wilkes-Barre, Pennsylvania. The Pennsylvania CLE Board has approved the seminar for 2 Substantive and 1 Ethics credit. -Last but not least, it's a half day out of the office at a nice event! In addition to my presentation of an Auto Law Update, the other presenters will include Attorney Paul Oven of the Moosic, PA law firm of Dougherty, Leventhal & Price on a Civil Litigation Update, as well as noted expert radiologist (and attorney) Dr. Michael Brooks presenting on diagnostic studies in personal injury matters, with an emphasis on auto accident matters. The Judicial panel for the "View from the Bench" portion of the program will consist of Pennsylvania Supreme Court Justice Michael Eakin, President Judge of the Superior Court Correale Stevens, and U.S. Third Circuit Court of Appeals Judge Thomas Vanaskie. President Judge Thomas F. Burke, Jr. will also provide a "State of the Luzerne County Bench" presentation, reporting on which new judge will be handling which types of cases along with an update on the current status of the Luzerne County civil trial backlog. The View from the Bench portion will be presided over by former Luzerne County Judge Joseph Van Jura, who recently completed his appointment and has returned to private practice where he is also offering his services for Mediations and Arbitrations. 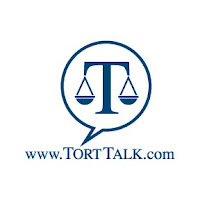 The TORT TALK EXPO 2011 is designed to be a CLE Program that will be as entertaining and informative as the posts regularly sent out from the Tort Talk blog. The seminar will be immediately followed by a cocktail reception at which attendees can continue to network with fellow lawyers, insurance professionals, and members of the federal and state judiciary from around Northeastern Pennsylvania. Also, a portion of the proceeds from this event will be donated to a local charity to be determined. 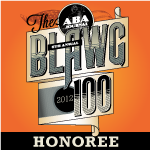 12:30 p.m. to 4:30 p.m.
Presenter: Daniel E. Cummins, Esq. Presenter: Paul T. Oven, Esq. 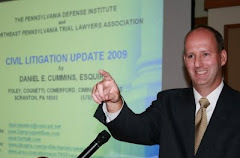 Luzerne County President Judge Thomas Burke, Jr. 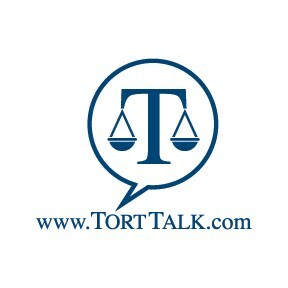 Please make checks payable to "Tort Talk." For reservations, please complete the requested information below and return it to the address noted below or e-mail it to dancummins@comcast.net. c/o Daniel E. Cummins, Esq. For more information, contact Dan Cummins at 570-346-0745 or at dancummins@comcast.net.